Stunning photo of adult red deer stag, bellowing near Chasewater with love on his mind, taken by G Richardson on October 11th 2011 and posted on Chasewater Wildlife Group's daily diary. This is just a quick note to warn people given to exploring the open spaces of the area that the deer population are getting amorous. 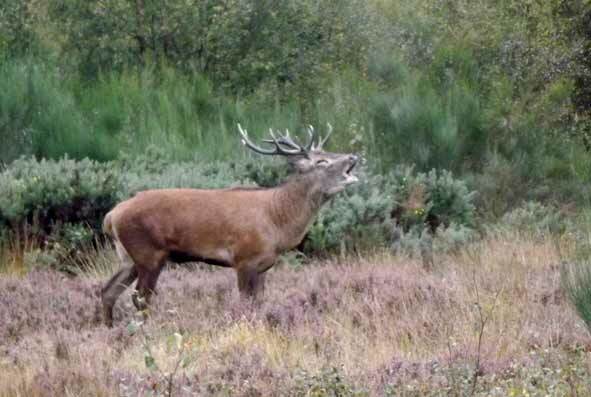 It’s rutting time for our large brown friends, and that means one thing: the heaths around Brownhills, Clayhanger, Pelsall and Chasewater in particular are likely to be host to rather grumpy, aggressive stags guarding their female harems. Deer are normally gentle souls on the whole, but a hormonal stag with love on his mind will be aggressive and prone to attack, and such animals will, and have in the past charged humans and gored dogs. To avoid being on the unexpectedly rather sharp end of several hundredweight of cervine cassinova with an attitude issue, please keep a respectful distance and keep your dogs under control at all times. Even if they look like they’re just loafing, these normally docile creatures can turn nasty at a moments notice. This warning applies to anywhere where deer have been spotted – from the heaths of Chasewater to the commons and woods of Brownhills, Jockey Meadows, Clayhanger Marsh and even Sandhills. Deer are not the cleverest of animals, so it might also be wise to take extra care when driving, as the biological imperative is probably outweighing their small amount of road sense at the moment. Both Chasewater Wildlife Group and Clayhanger’s Chaz Mason have recently posted warnings. Today was the day that many of my neighbours discovered that Red Deer were not mythical. As I left the house my neighbour Sadie came out in high excitement to tell me there was a stag and five hinds on the set-aside. Both she and my other neighbours Ken and Glenise had been watching them from their bedroom windows. At 9.25 I was walking across the recreation ground and had just told Ken that there was no chance of me seeing one when a juvenile stag came racing across the football pitch fifteen feet away and disappeared into the bushes. There was then a brief pause and an almighty splash as the deer apparently threw itself into the Ford Brook! As many of you will know, October/November is the time of the year when deer are most active (in more than one sense of the word!) and it is a really good idea to keep a distance from them, particularly if you have a dog with you as a stag is likely to protect his harem with some aggression and at least one local dog has been pronged in the back for getting too close. Of course, once the aggression is over for another year, the commons and heaths will again be given over to the disgusting and lewd mating behaviour one normally sees there. The animals, however, will be behaving impeccably. This entry was posted in Brownhills stuff, Cannock Chase, Chasewater, Clayhanger stuff, cycling, Environment, Events, Followups, Fun stuff to see and do, Interesting photos, Local Blogs, Local media, News, Reader enquiries, Shared media, Social Media, Spotted whilst browsing the web, Walsall community, Walsall Wood stuff, Wildlife and tagged Brownhills, Chasewater, Chasewater Wildlife Group, Chaz Mason, Clayhanger, Clayhanger Marsh, Cycle rides, cycling, G Richardson, local blogs, New Photos, Red deer, Reservoir, rut, rutting, Shire Oak, Silly, Staffordshire, Walsall Wood, Wildlife. Bookmark the permalink.